I've been saving my irrelevant personal rant on the Food Guide Pyramid for months now... and somehow it has become topical! The Food Guide Pyramid is something I randomly mill over about once a year. It baffled me regularly as a kid. I mean, honestly who came up with these preposterous guidelines?? 6-11 servings of grains DAILY?! 3-5 vegetables, 3 servings of poultry- who in their right mind could eat that?? I discovered a revised Food Guide Pyramid via the USDA updated a few years ago. What was labeled as "MyPyramid" was tailored to each individual. Because, according to the website "One size doesn't fit all." Wow, it finally made sense after all these years to people (whose full time job it was to create a guideline pyramid) that everyone's body and age might be different and so too should be the food they intake. The graphic also has a dude walking up the pyramid to stress the importance of exercise while eating properly. But all in all the graphic was still overcomplicated. And according to NYU nutritionist Marion Nestle, "It was foodless and useless" and "impossible to decipher without logging on to the USDA website." Well now, this just in - the Food Guide Pyramid is gone! The Obama Administration says "its just too confusing" even with its recent update a few years ago. 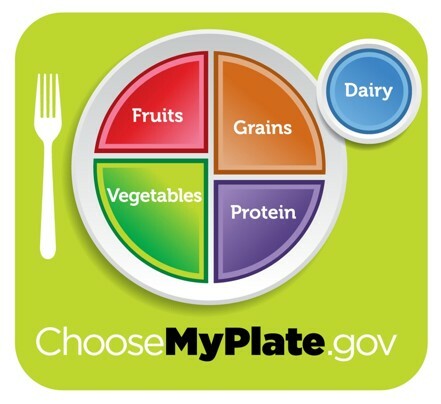 So ditch the pyramid and welcome "MyPlate". A simple approach to explaining daily intake. Gotta hand it to Michelle Obama for what she is trying to do with this country in terms of staying fit and eating right. Afterall, two thirds of American adults and one third of kids are overweight or obese. This is not acceptable. Whether or not people follow it is another thing but at least this is a step in the right direction and I don't feel obligated to eat 11 slices of bread and 5 yogurts everyday.